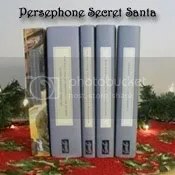 It was Stacy of Book Psmith who came up with the Persephone Secret Santa idea. She is a girl after my own heart. What better way to feed your book hunger, and indulge in a purchase from one of the coolest small publishers currently printing, than to pick out a book for someone else, and, throwing caution to the wind, let someone else choose a book for you? There’s so much that is wonderful and exciting going on there! 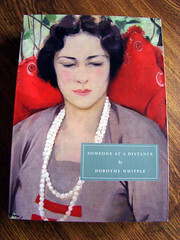 As for me….drum roll please…the fabulous Mrs. B of The Literary Stew sent me Someone At A Distance by Dorothy Whipple. I couldn’t wait much longer than the time it took me to go from the post office to my car before tearing into the package, and I gasped with delight as the gorgeous book came tumbling out. All in all, there is satisfaction brimming today at each of the Persephone Secret Santa’s blogs. I’m pleased to have discovered a few more readers and writers with whom I’ve found common interest and I can’t wait to see what everyone thinks of their new books once they get around to reading them! A huge thanks to Stacy for her brilliant idea and stellar organization. Merry Christmas everyone! Woohoo…we got the same book! Like you, I can’t wait to read this one. I couldn’t help but smile picturing you jumping in the car and ripping open the box to find your treasure. Perhaps we will read it at the same time and we can compare notes:) Happy reading! And thank you for all your kind words! I received The Making of A Marchioness, as well as giving it, but I also bought myself Someone At A Distance because apparently I’m a greedy little pig. One can never have too many Persephones! We’ll have to chat after we finish The Marchioness. Haha, I’ve just told the same stories to you both – we’re passing each other in the blogosphere! Bellezza – I’ll have to get my hands on the Marchioness soon, and I’ll be eager to see what you think of Someone at a Distance! You got a Whipple, so curious about this author after the infamous Virago refusal to print her. Jodie – It’s funny that she had a lot of popularity and many books published – and it was just this one that got point blank discarded! Yay, congratulations on a lovely exchange, Sarah! I dithered too long and so didn’t end up participating, but I agree that this was such a cool project. I think you picked out a wonderful Persephone for Karen of BookBath. You really cannot go wrong with Frances Hodgson Burnett! Someone at a Distance by Dorothy Whipple is a fantastic choice! Lucky you, enjoy it! I am kicking myself for forgetting to sign up for this gift exchange, hopefully next year I will remember. But it is fun to hear about all the wonderful; Persephone books given and received. Amy – Ooo, I’m glad you approve of both books. It’s so hard to know what to pick when you haven’t read any. Fabulous choice by Mrs B! Someone at a Distance was only the second Persephone I read and I loved it; it is such a raw evocation of the destruction that infidelity causes. I sooo want a Dorothy Whipple. Isn’t this a fabulous gift exchange. We all are receiving things we love, and are happy for one another’s happiness. And for me, the beginning of a new interest (obsession) I am afraid. Happy reading and happy holidays! I’m so glad you like it! I discovered Dorothy Whipple this year and have gone through quite a number of her books and loved them all. She has found a place as one of my favourite writers. I can’t wait for you to read it and post your review. Enjoy! Claire – Phew. Not a topic that I’m a particular fan of, but I think I’ll be in good, insightful hands. Frances – Half the fun has been seeing what other people got, yes indeed. All the excitement of Christmas morning has sprung out of this gift exchange.